We have been transporting construction equipment to and from sites around London and the South East since 1961 and hold an unblemished Operator’s Licence. We also conform to all VOSA requirements and government legislation. We want to work with you to ensure that the transportation of your site accommodation, and toilets, to and from site is carried out as smoothly as possible. The following provides you with details of our transportation processes and information we require from you. All the information below relates to the delivery and collection with our lorry loader vehicles. Once our driver has followed site instruction to off load and has ensured the unit is leveled, they will show your site representative around the unit and explain how to operate it. They will then de-rig and leave site. In line with CDM Regulations we operate on your site under your responsibility and in accordance with your Lift Plan. We have a fleet of our own lorries, which we supplement with external hauliers, who have been tried and tested for many years. The largest crane lorry is 80ton/metre, able to conduct a full 360 degree lift at full capacity. In general the capabilities of our lorries mean we save you time, money and cause less disruption to your sites. All method statements are drawn up in accordance with IOSH assistance. Generic Method Statement and Risk Assessment are provided when requested. We can supply you with the pressure under the outrigger and the size of pads to be used for each lift, if requested. A copy is carried on the vehicle and can be supplied prior to delivery. Our COMBI-GEN welfare units and others do not have an evenly distributed load and therefore the centre of gravity is offset when lifting. All method statements are drawn up in accordance with IOSH guidance. Generic Method Statements and Risk Assessments are provided when requested. In line with our policy of continuous improvement, our Safety Consultants carry out random unannounced site audits in relation to deliveries and collections. Please email hiredesk@rawley.co.uk for more information or give us a call on 01268 722304. Please provide us with full site address including postcode wherever possible. To make your delivery or collection more efficient please ensure that you provide the name and mobile phone number of your site manager or representative. Will Rawley staff require off site inductions before the delivery? Will they need to attend on-site inductions? Is there a designated access route to and from the site? Are there any periods between which the site cannot be accessed during a normal working day? Please be aware some restrictions may incur additional cost. Are there any width or height restrictions on entering the site or where you are planning to locate your welfare unit or site accommodation facility? We require a minimum width of 3 metres (assuming the vehicle and its trailer can enter the opening square on) and a minimum height of 5 metres to access your site. To operate the vehicle we will also need additional operating area to extend the legs, as required. Is there a traffic management plan prepared for the project? If so please email a copy to hiredesk@rawley.co.uk so that we can ensure our driver is briefed accordingly. Are we delivering the unit from the road? If this is the case, it is your responsibility to organise traffic management to ensure the driver’s and the public’s safety. Are there any restrictions leading to the site access? For example, main road, cul-de-sac, narrow roadway, low bridges, street parking, overhead power lines etc. 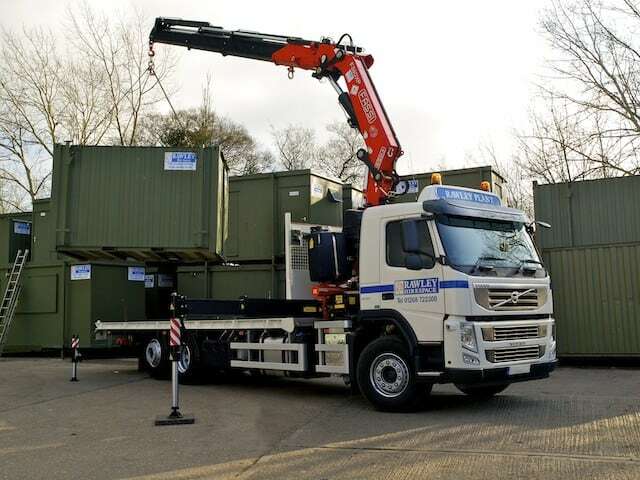 We like to make sure our drivers are provided with unhindered access to site, this includes ensuring that you have applied for any dispensation from the local authority to allow equipment to be sited on the highway. For more information about dispensation please refer to the local authority website or click here for an example. Will the ground be levelled (within reason) in the location of the unit’s position? Will the ground be compacted in the location of the unit’s position? Please note vehicles are only taken off the highway at the Hirer’s risk. Our drivers may request that you read and sign our disclaimer if they have assessed that the ground is not compacted adequately to take the weight of our vehicle. 50% of our vehicles operate to the Euro VI low emissions in London. We have a target of 100% upgrade of all our vehicles to Euro VI within the next three years and any new vehicle we purchase will meet this standard. We are FORS, Silver Level Members (Freight Operator Recognition Scheme) and we have a CLOCs certificate. Lift complexity on which our generic RAMS are prepared is basic.